Risk of Ruin: Lucky or Unlucky? My wife and I recently bought a house halfway across the country, realizing a lifelong dream to live in the mountains. It was not without its scary moments, but the end result was amazing and fulfilling. Looking back, many of the facets of the transaction that looked like a deck stacked against us were, in fact, the best possible things that could have happened. Seldom do I treat directly with real Risk of Ruin, but today I will. After a couple years of looking online and informally looking at neighborhoods and houses while vacationing in Colorado, D and I finally narrowed our search down to the foothills west of Fort Collins. My employer had agreed to let me work remotely, and after finishing up her PhD in Biology, D planned to look for either forestry or university work. Fort Collins is a good location for both of those things. For my part, I needed somewhere with a solid broadband connection so I could do my job, and D needed to be not-too-far from Fort Collins since she would probably be commuting. After our "drive-by stalking" adventures, we knew we wanted mountain property with lots of trees, but some open areas, too. And we wanted at least 10 acres of space that we could easily use without climbing gear -- too many houses in the mountains are perched on a cliff and crammed into a corner of their lot, leaving the residents unable to get to the rest of the property because of the terrain. Broadband, short drive-time, trees, meadows, mountains, and lots of land. Not an easy combination of things to come by. We had several candidates favorited on real estate websites like Zillow and Redfin, but of course you can't buy real estate online. So in the early spring a high school friend of D's that had moved to Fort Collins recommended an agent, and home shopping began in earnest. On our first trip to meet with the agent, he had about 10-15 properties for us to look at, and we visited them all (with one exception). Some of them were already on our favorites lists, and three in particular we recognized and were especially interested in. Of those three, we didn't get to see one because a tree fell on the current owner the day before the showing. Another wasn't nearly as good in person as online -- there were a lot of things that looked like they could be maintenance nightmares lurking under the surface, especially the garage, which had excavated top-soil pressing against its back wall. That house will come up later as the Garage House. Almost none of the houses we looked at had high-speed internet. The third house, though, was much better than the pictures. It was on a large square lot with both forests and meadows, it was right off a main road only about 20 minutes from town, and the owner had gone to the expense of a major internet upgrade that he put in for himself so that he and his wife could work effectively from home whenever they wished. We returned to Chicago, and after thinking about and talking about this property for a week or so, we ran out of reasons not to put an offer on it. And so we did. A quick digression about regional weather patterns: there were record-low snowfalls in the Colorado Rockies over the 2011-2012 season. Since melting snowpack is where most of the moisture that feeds the region comes from, an extremely dry summer with very high fire danger was expected. Worse, the Rocky Mountain Pine Beetle epidemic is sweeping across the forests of northern and central Colorado, leaving millions of dead pine trees in its wake. As soon as it looked like we might be buying a property in the Colorado mountains, I started reading up on protecting my property from wildfires by removing the dead and infested trees. I knew that I was moving into a high-risk zone, and I wanted to be as prepared as possible. The volunteer fire department is located only about 1/3 mile away, which is very encouraging, but preventing fire is always preferable to fighting it. Our initial offer went to the sellers on May 12, 2012. On May 14, 2012, the Hewlett Gulch fire started on the north side of the Poudre Canyon, about 4 miles from the house. D and I watched carefully as it was fully contained in about a week, thankful that there was a river, two roads, and a ridge-top between the fire and the property we hoped would soon be ours. Fire fighters managed to bring the fire under control without losing a single structure. The fire was the largest that Larimer County had ever had, at 7,685 acres. We returned to the property on June 2 to do the inspection. Encouraged by the results, we returned home elated, and put our own house on the market. On June 9th, we spent the day visiting with D's family, who threw her a going away party. There was much interest in our plans, and the Hewlett Gulch fire, so we happily chattered about how excited we were about the new property, and how relieved we were that the horrible fire hadn't gotten too close. During the party, D received a text from our Fort Collins friend -- she didn't read it until we got home that evening, and it went something like this: just thought you guys should know there's another fire burning near your new place. That fire, it turned out, was the High Park Fire. Over the course of the next three days, the High Park Fire exploded in size, screaming across the entire Rist Canyon area. In the initial days of the fire, getting everyone to safety was the first priority. This meant that the limited resources already in the area couldn't do much to protect structures. Structure protection was much more effective later after the personnel fighting the fire increased from 250 up to its high somewhere near 2500. We watched in horror as the fire seemed to circle our new house, expanding first to the northeast, then the south, then back to the west again. Entire neighborhoods of houses were wiped out, for a total of 118 in the first few days. The Garage House survived, but the garage itself was destroyed and nearly all the trees on the property were reduced to blackened toothpicks. The sellers' agent also lost her house during those first few days. Eventually, the fire completed its circuit around and mostly filled a more-or-less square area 41,142 acres in size. Right in the center of that area was a little diagonal patch of unburned ground running from northwest to southeast along the road. In the middle of that patch was our house. Bear in mind, we were still negotiating the contract when the fire broke out. Our earnest money was sitting in an escrow account protecting our offer, and things like the inspection and water potability test had been removing our excuses for canceling the contract. Of course, having a fire come through and destroy the house would certainly be a good excuse. But the earnest money was only 1% of the purchase price, so we could afford to walk away at any time if we decided we weren't comfortable, without any explanation. And that topic definitely came up in our conversations, especially the morning of June 13, when we saw that the unburned patch of ground had shrunk overnight, and now our new property was within the burn area. Both D and I started preparing ourselves emotionally for what we were sure was coming: a phone call from our agent informing us that the house had been heavily damaged or destroyed. But that call didn't come. Instead, the seller -- part of the volunteer fire department battling the blaze -- reached out to me directly via email, sending me pictures that painted a very different story than the doom-filled media reports of walls of flame 200 feet high marching inexorably across the landscape. Those flame-walls were real, but they weren't representative of every part of the burn area. In many places, the fire contented itself with ground fuels, leaving the tops of the trees untouched while consuming the fallen needles, branches, scrub, and grass. Looking at the pictures, I almost couldn't believe my eyes. Instead of the blackened moonscape I expected to see, I saw green grass, green trees, and occasional black stripes on the ground where the fire sent out a finger, testing the defensible area around the house. The pictures were strategically shot, showing me bits of burn area but mostly focusing on the green stuff. I can't really blame the seller for that, he was trying to keep me from panicking and killing the deal -- and he surely knew that we would be visiting prior to closing and would see the whole story, so I view his shot selection as reassuring, rather than misleading. On June 15, we learned that the major insurance carriers had all frozen the writing of new policies in the area indefinitely, as of the start date of the fire -- June 9. We obviously couldn't imagine buying a house with no hazard insurance, and the bank requires hazard insurance in order to approve a mortgage, so that had the potential to kill the deal. On June 16, after making some calls to find out more details, we discovered that our insurance policy had been delivered to our loan underwriter on June 8, one day before the freeze went into effect. Our agent promised to head up into the canyon as soon as the roads were reopened to take some pictures and video so that we could see the full extent of the situation and make a decision about the closing. Despite our house being spared, the fire was nowhere near done. The management team spent the next two weeks scrambling to create and defend a line of containment around this fire, as record high temperatures, 30-50mph winds, and single-digit humidity levels all contributed to make the fire extremely aggressive and difficult to predict. Many stories have been written about the High Park Fire, so I won't repeat them except to give the final stats. By the time full containment was reached on July 1st, it had burned 87,284 acres making it the second-largest in Colorado history. 259 homes where destroyed in the High Park Fire, making it the most destructive fire in Colorado history (that record was broken immediately by the Waldo Canyon Fire outside Colorado Springs). Not including the property damages, the actual fighting of the fire cost $39.2 million. Progression through June 23. Expansion in WSW corner is not mapped. We had a closing date of June 29 scheduled, but our agent couldn't get into the canyon to view the house because the road hadn't been reopened. After much soul searching, we decided to fly out anyway, and to be very thorough with the final walk-through, since that would be our last chance to pull out. As the day drew nearer and nearer, we started questioning the prudence of closing on a house that remained evacuated and in an active fire zone. On June 28 in the late afternoon, as we were boarding our plane to Colorado, the evacuation was lifted. Only residents could pass the National Guard checkpoints, but we had the selling agent to drive us up, so that was no problem. D and I wandered around the property and the house with our agent for about two hours that morning. We saw lots of devastation in the surrounding forest, but we saw plenty of hope, too. The views from the house are largely intact, with the worst destruction occurring deep in the forest away from the house. Most of the burn visible from the house is limited to grass damage, which will repair itself in a matter of months. There was minor smoke damage to the interior walls, but the seller's insurance covered its professional mitigation before we moved in. We found many green shoots pushing through blackened vegetation. But in the process of walking that property and surveying the situation, as well as conversations with the seller before, during, and after closing, we learned some terrifying details about the events of June 12. It turned out that our seller/firefighter was defending his real estate agent's house and had to let it go because a huge wall of flame was sweeping up the hill from the road. He and his partner barely made their escape and were forced to cut the hose for lack of time. Despite this near-death experience, he chose to spend the night in his/our house so he could defend it. In the dusk, he and fire personnel from 3 other trucks felled trees, laid out hoses, and plowed dirt rings between the forest and the house -- effectively fortifying what was already a defensible zone. About 2am, he awoke to see an orange glow in the west-facing windows, so he wearily donned his protective gear and headed out expecting to watch the fire die at the fire break. Instead, he discovered that it had jumped the break and was within 10 feet of the western wall of the house. With his pre-laid hose, he was able to shut it down and contain the remainder of the fire behind the fire break. At some point he also had to turn his attention to the detached garage, which was closely threatened on its north and east sides. Propane tanks for both the garage and house show burned grass beneath them. Many, many friends and relatives have tactfully or tactlessly asked us if we're crazy for completing this transaction. 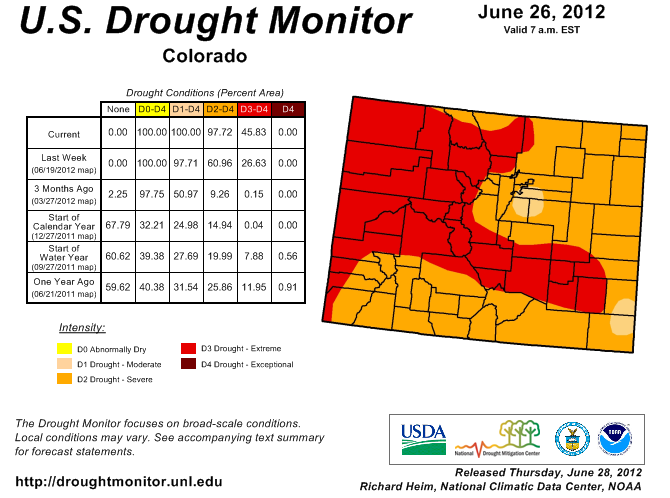 Our logic ran like this: the entire Front Range is experiencing record-dry drought conditions this year, making the fire danger extreme throughout all of our potential home sites. Now that the High Park Fire has burned away most of the fuel in Rist Canyon and the surrounding areas, another major fire in that area is unlikely for the next 20 years or so. So which is better? an area that has some black eyes but won't burn again for 20 years, or a pretty tinder box that could go up at any moment? Our luck was magical: one day later with the insurance, and the bank would have killed the deal. Ours was the first real estate transaction to close after the fire. One day earlier with the closing date, and the evacuation order would have remained in place and our agent would have talked us out of closing. Ten feet more from the fire, and our beautiful new house would have been damaged or destroyed, and our seller would have been in grave peril. We also learned later that the Garage House was sold and closed on June 8. So those poor buyers, the very next day, found themselves thrust into an evacuation situation. We were spared that, since we were still in Chicago and in the stressful but safe situation of being able to simply cancel the deal if the house was damaged. All the other homeowners in the area had to wait and see if their summers would be spent rebuilding -- we could wait to see if we had to restart the real estate shopping or not. Words cannot express my gratitude to the previous owner of our new house, as well as all the men and women on the many fire-fighting agencies that came together to contain this fire and protect the structures within it. But especially the seller, because I know he risked his life for the property, and then thought to take pictures to reassure us the next morning. He was an absolute prince of a man throughout the entire transaction, and I like to think that I can now number him as one of my friends. Next time someone wants to complain about the stress of buying a new home...I'm sending them to this page :) Happy for you two and I cannot wait to come out as see you guys! Nate says hello! !